Picking a Good Domain Name: Say Cheese! Isn’t GuruEffect.com a little vague? Shouldn’t you have the word SEO in your domain name if you want to be ranked well for SEO Guru? An exact-match domain name is great, but not always the best. We could have easily registered a domain name that included the words “SEO” and “guru,” but that would be silly. Especially when I had this name, just sitting around collecting dust. When it comes to SEO (search engine optimization), one thing that most professional consultants agree on is that an aged domain does better in the results than a brand new one. Of course, that makes perfect sense to me. Otherwise, search engines could be too easily manipulated by spammers who quickly put together a keyword-rich domain name, use a bunch of “black hat” techniques to gain some quick SERP, and when they get caught- they could just take down the site and do it all over again. That used to work brilliantly. I..uh…know a guy who once used exact match domains in that very fashion. It used to be a cheap way to guarantee good position for a niche long tail keywords. Miami-Beach-Condos-For-Sale.com anyone? If you own a domain for ten years, and you register it for another ten years into the future; it shows good faith. Not only that, but you get the domain registration at current prices and you lock in. We recommend every client, after choosing a good domain name, register it for ten years. When stock guru Warren Buffet talks, people listen: Copyright by Mark Hirschey, May 6, 2005. But I digress…When this stock market Guru talks, people listen. 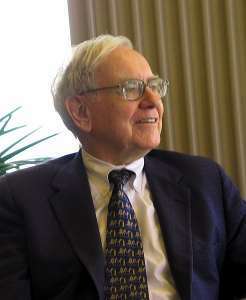 Image of Warren Buffet courtesy of Wikipedia. It turns out, that a long time ago– maybe 5 or 6 years– I was involved with creating a website to track the “guru effect” in the stock market. I had a friend who was getting rich from after-hours trading, so we decided to blog about his crazy technique. We had nothing better to do. What my friend did was watch Mad Money every night– and when Jim Cramer started blowing the whistles and ringing the bells about a hot new stock that everyone just had to buy– my friend would make a (somewhat risky) after hours trade. When a stock guru does something- like Warren Buffet dumping all of his Intel stock recently– the rest of us tend to follow. That is the Guru Effect in action, textbook definition. Well, fortunately, I was “stuck” with this domain name for about six years and now (sound the trumpets), I shall blog here. I’ll provide tips and tricks about SEO amongst other things, sometimes, totally random. I might write another post about cake decorating. You never know. If you’re smart and have a budget for SEO, you’ll hire GuruEffect.com to help you. But a do-it-yourselfer should find lots of little gems hidden in these pages too. We aren’t stingy. There are way more bad websites than there are web developers and SEO gurus.